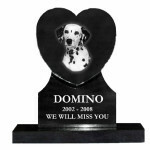 Human or animal, our loved ones should be memorialized. Below are a few options to choose from. All Laser Etched. Include your pet’s image. CALL for pricing!